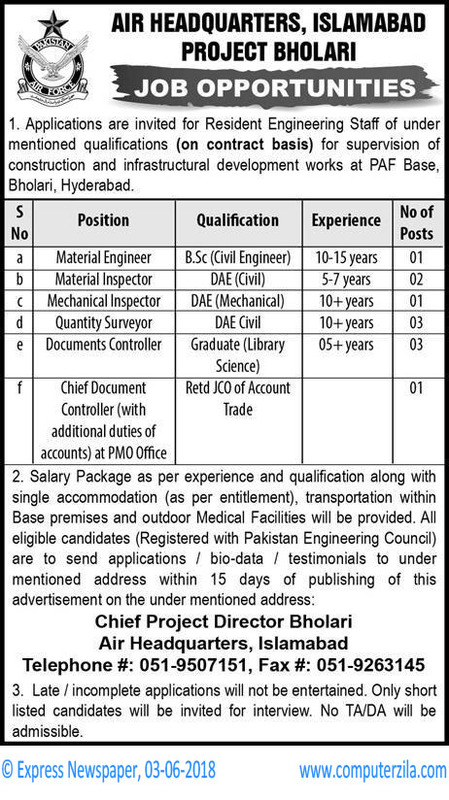 Jobs Opportunities Project Bholari at Air Headquarters Islamabad (PAF) in Hyderabad, and Islamabad Cities. Air Headquarters Islamabad is a Government Organization which requires employees for Administrative, Engineering, Material Engineer, Mechanical Inspector, Quantity Surveyor, and Staff Jobs in cities Hyderabad, and Islamabad. Air Headquarters, Islamabad offers jobs for Project Bholari, the jobs are contract basis for Resident Engineering Staff to supervise constructional and infrastructural development works at Pakistan Air Force (PAF) Base Bholari Hyderabad.